It’s no secret that I love to cook. 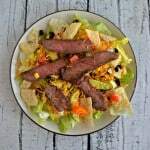 During the week I make quick and easy weeknight meals but I on the weeknight I like to make dinner a little more special. This often means buying a more expensive piece of meat or cooking a meal that takes a while to prepare but it totally worth it in the end. I am a big fan of grilling and believe that one of the best ways to cook beef is on the grill. I love making the perfect diamond sear marks on my steak while cooking it on the grill. Unfortunately for me, I live in a place where it snows a good portion of the year which makes it hard to pull out the grill and use it during the winter months. Years ago we had a grill pan that we loved and used often in place of grilling outside. In the years since we moved I haven’t seen it so last weekend I went on a mission to Macy’s to find a great grill pan. They have a great kitchen section and I knew I’d find what I was looking for. 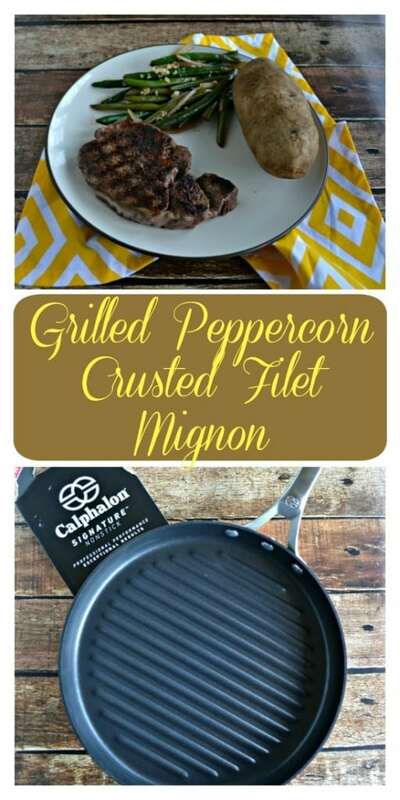 After looking at several grill pans and comparing the features I settled on Calphalon Signature™ Nonstick 12″ Round Grill Pan. The nonstick surface of Calphalon’s Signature™ Nonstick pans comes with a full lifetime warranty. Since I often find my nonstick pans losing their nonstick qualities I was happy to hear about the warranty. These pans combine the convenience of nonstick cookware with the durability and performance of stainless steel cooking. In fact, the nonstick surface is so durable that I can cook on it with metal spatulas, spoons, or even a whisk! After my trip to Macy’s I went to the grocery store to pick up filet mignon. I picked out two and was going to purchase them when I saw that a whole beef tenderloin was on sale for $8.99/lb. Knowing that I could easily cut a whole tenderloin into 12-14 steaks I picked one up and put it in my cart. I also grabbed a few baking potatoes and some fresh green beans. Back at home I had to cut up the tenderloin. I carefully made the first steak then used it to slice the other ones. When I was finished I ended up with 12 filets, a pound of stir fry meat, and half a pound of stew meat. I didn’t want to waste anything and I ended up throwing little away. 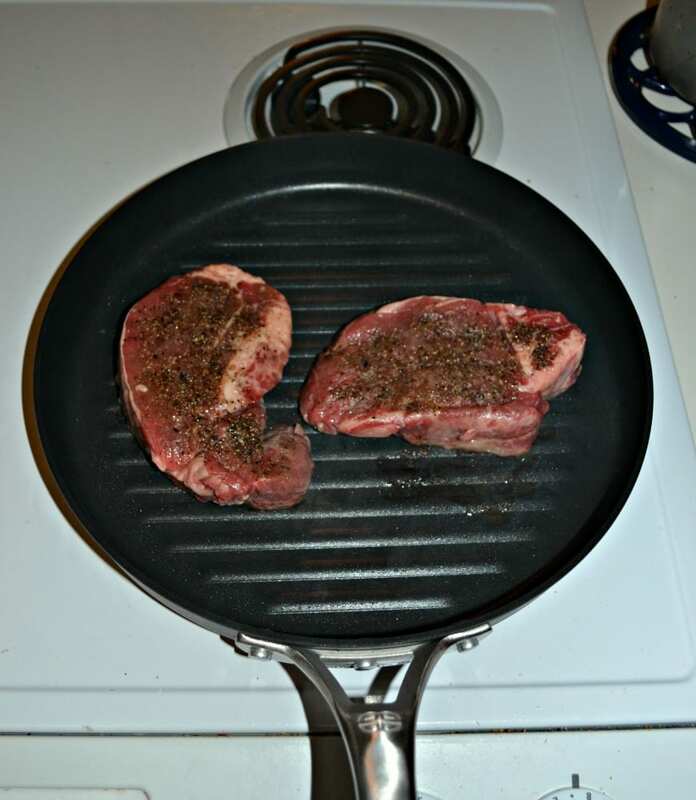 After choosing the two steaks I wanted I prepared them for grilling on my new Calphalon Signature™ Nonstick grill pan. Even though I was making them in a pan and not on the grill I wanted them to have the pretty diamond marks. It only takes a few easy steps to make these marks in a grill pan. In order to get those pretty diamond marks on the steak you need to have a little oil on the steaks to sear them. 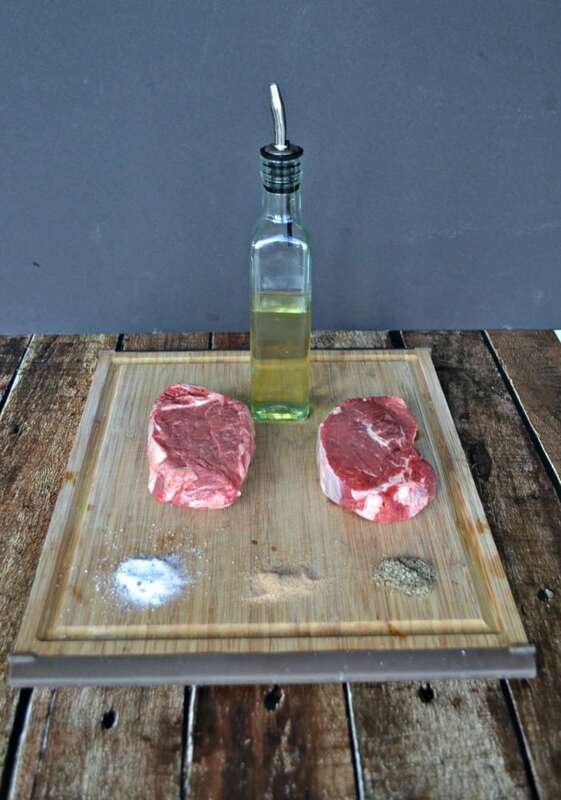 Rub a teaspoon of olive oil on each side of your steaks. Because I’m using a grill pan, the sear marks will only be where the steaks touch the pan. Don’t put the steaks into a cold pan. The key to beautiful grill marks is to heat the grill pan over medium high heat for 2-3 minutes before putting the steaks on. This sounds simple but it’s the key to diamond grill marks. 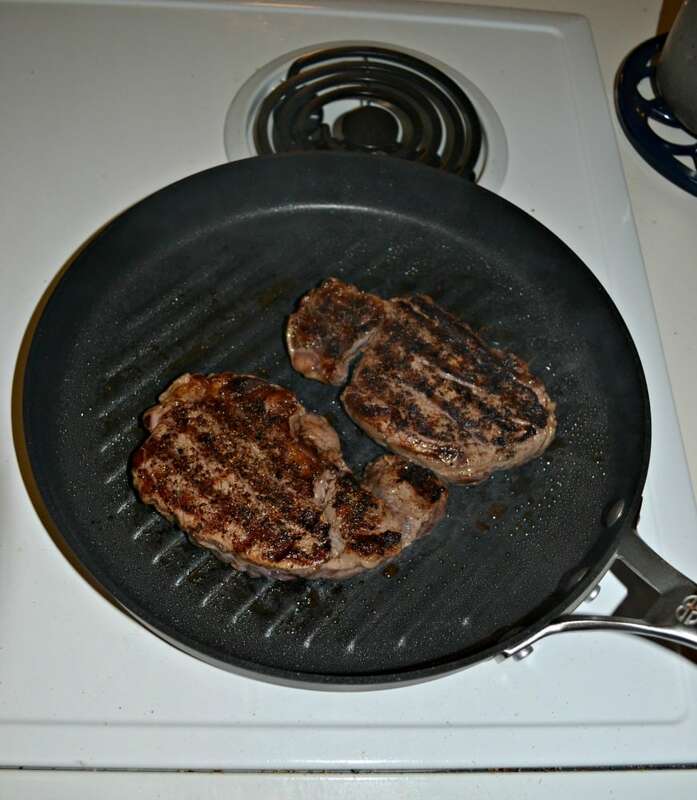 I often turn my grill pan so that the raised grill marks are horizontal. That way I know where to place my steaks. Carefully put the steaks in the pan paying attention to how they are sitting in relation to the grill. After 3 minutes carefully lift the steak and rotate it 90 degrees. Set it down and do not touch it for another 3 minutes. This will create the grill marks on one side of the steak. To get the grill marks on both sides carefully flip the steak over onto the other side, paying attention to the grill lines. Cook for 3 minutes then lift the steak and rotate 90 degrees. Cook for 3 additional minutes. In additional to make delicious (and beautiful!) steaks for dinner, I put two potatoes in the oven and baked them until tender. 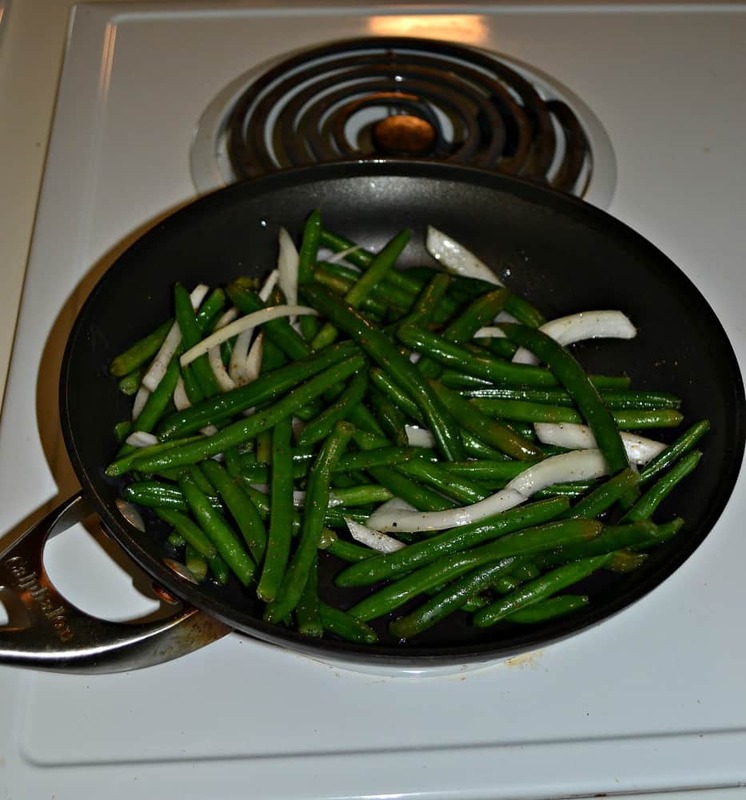 I also made a side dish of balsamic green beans. 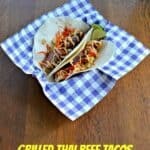 I made these in one of my 10″ Calphalon nonstick pans. It’s a great size for making side dishes. While I was finishing dinner my husband chose a nice bottle of champagne to go with our meals because every Saturday night gourmet meal deserves a special beverage. He poured the champagne as I served the meals and we enjoyed a delicious dinner together. Enjoy a delicious and perfectly seared peppercorn and garlic crusted filet grilled inside on a grill pan. 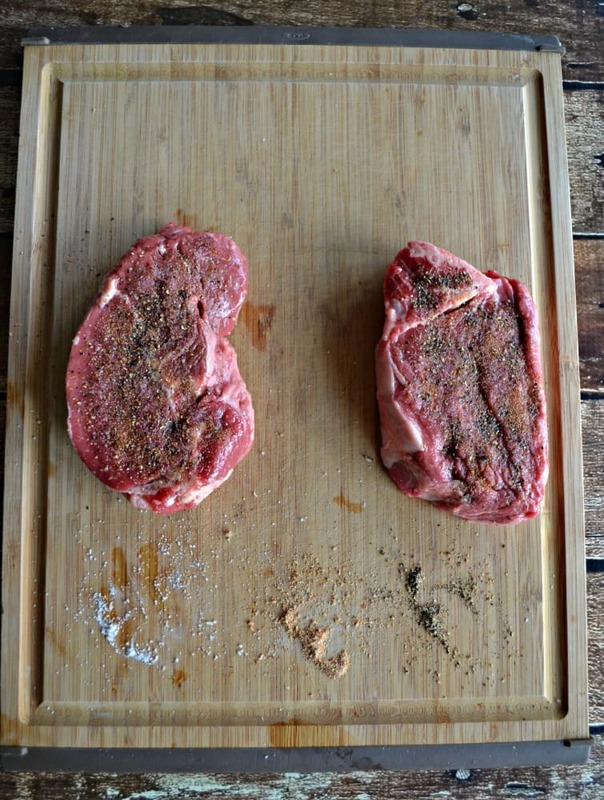 Place the filets on a cutting board. Rub each side of the filet with 1 teaspoon of olive oil. In a small bowl combine the peppercorns, salt, granulated garlic, and rosemary. Rub 1 tablespoon of the mixed on each side of the filets. Allow the filets to rest for 15 minutes on the cutting board. 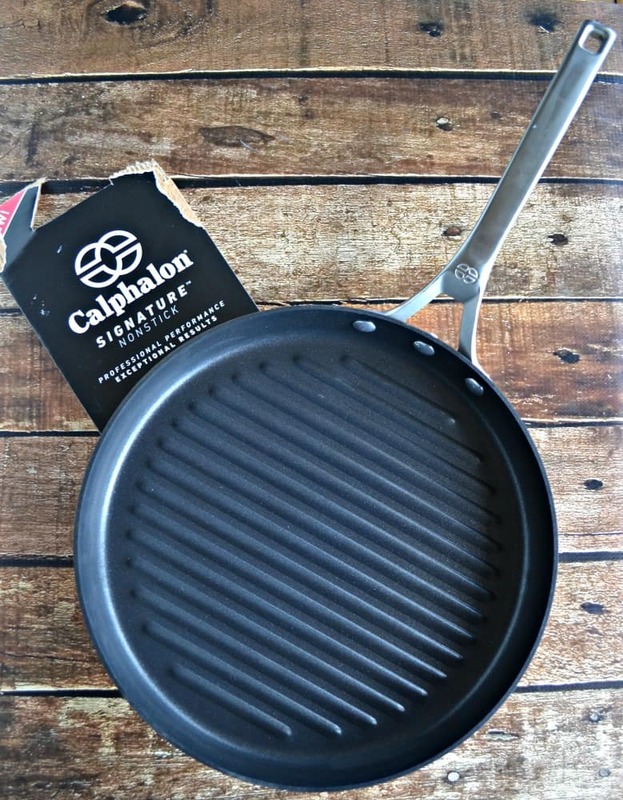 Place the Calphalon Signature™ Nonstick grill pan on the stove over medium high heat for 2-3 minutes or until hot. Rub a paper towel with olive oil and using tongs, gently rub the oil all over the grill pan. (This will help to sear the steaks). Carefully place the steaks on the grill pan. Cook for 6-8 minutes per side using the method to make perfect diamond grill marks if desired. 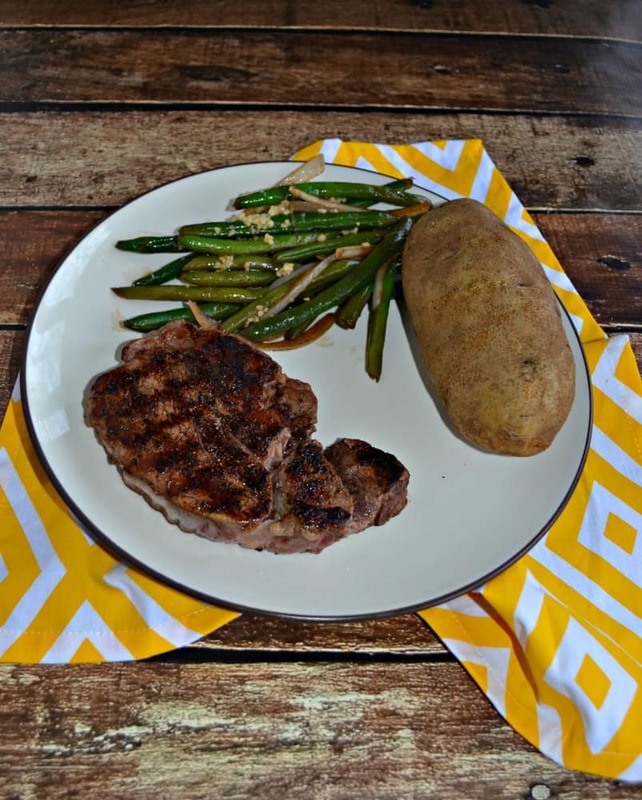 Check the internal temperature by using a thermometer (cooking for an additional 2-4 minutes if needed) and when it reaches 130 degrees remove the steaks from the grill pan and place on a cutting board. Tent with foil and allow to rest 5 minutes. (This should bring the temperature up to 135 which is a perfect medium-rare). 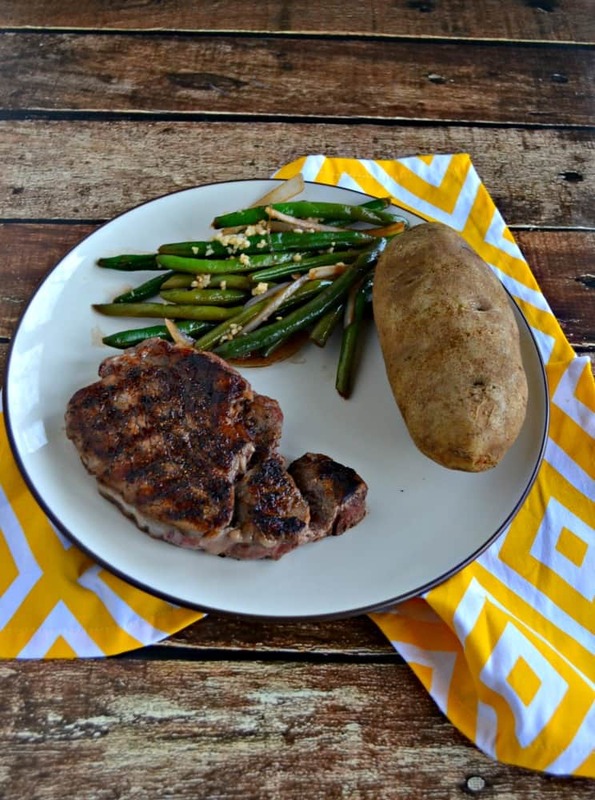 Serve on a plate along with a baked potato and balsamic green beans. Do you want to grab a grill pan for yourself? 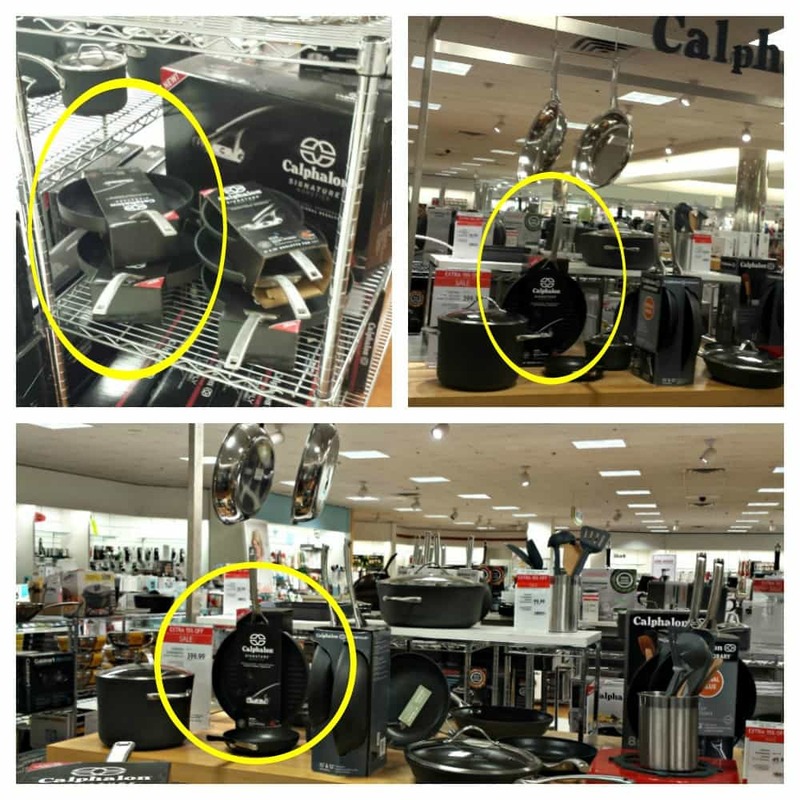 Make sure to check out Calphalon’s Facebook page or see the entire line of Calphalon Signature™ Nonstick and Stainless Steel cookware online at Macy’s. Only problem with this article is you seem to be showing a Delmonico type steak (which I prefer over filet mignon anyways) but the story should portray in pics what you are in fact cooking don’t you think? It is INDEED a filet. I bought a whole tenderloin and cut them myself so that’s why it might not look exactly like a filet but it is, in fact, a filet. Kelly, I totally hear you about making quick and easy dinners during on weeknights and splurging for a more decadent meal come the weekends. I love that you can get grill like without venturing outdoors (I, too, live in a cold climate). 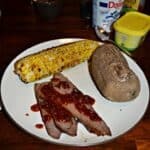 Great recipe and post. Thanks for sharing. Thank you! It is really nice to be able to “grill” indoors during the cold weather!